Even Judge Milian, presiding judge of The People's Court, acknowledged in 2012 that a lawyer is also in business (Feb 2012 episode, Lawyering up on your lawyer!). Being a professional, skilled only in the law, is not good enough. This last weekend while celebrating an early Thanksgiving in MO, I heard about my nephew, an Air Force JAG officer who is successful because he understands not only the applicable law but also the needs of his client. Run your business more effectively Get our "Starting Your Practice" book/CD package (below). When you think of the practice of law, what is the first thing that comes to your mind? Most people would say something like clients, cases, court, opening arguments, etc. This is all very important of course, but equally important are the business aspects of the practice of law. When the state bars, particularly those in New York and California, look at students going through law school and the requirements for their education, what they see is lawyers that are not trained and not educated well enough to come out of school and take a case to court. As a result of that, they are mandating more of what they call clinical studies requirements. They want law students to have practical legal experiences: they want students to hold the hand of the client, they want students to have a moot court, they want students to go to court to represent pro bono cases, etc. Although it might be true that lawyers are not trained and educated enough in law school, what the bar associations are missing is that the law schools still are not teaching law students and young lawyers how to run a business and how to become a good associate who contributes to the profits of the larger firm by more than just billable hours. Being a lawyer means more than knowing the ins and outs of court filings. A good lawyer also has to have solid accounting knowledge so that he can budget and create a financial plan. A good lawyer has to be skilled at the art of how and when to bill. A good lawyer has to be savvy about marketing techniques. A good lawyer has to be able to incorporate technology to the advantage of his practice. A good lawyer, in other words, must understand that business skills are just as important as legal skills. Want to get your practice off to a great start? 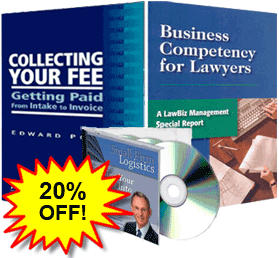 Ed Poll provides you with ways to simplify the process of operating a law practice. His insightful strategies and tactics help you find satisfaction and fulfillment in your career. Create a firm that will be successful by design, not by accident, and you'll be more effective with your clients and more profitable. Learn more.